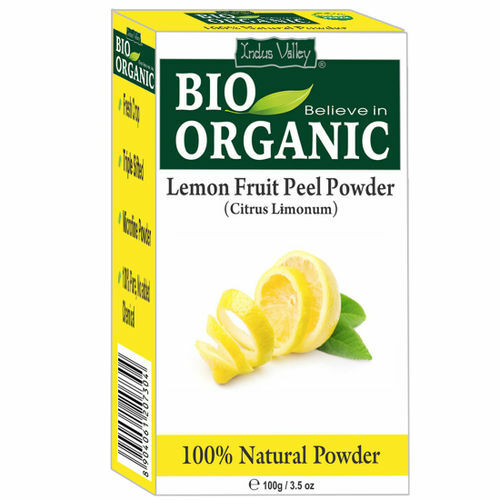 Indus Valley Bio Organic Lemon Fruit Peel Powder comes with an array of advantages in terms of skin care. This powder caters to a variety of skin needs that helps to enhance the beauty quotient in an absolutely natural manner. The dehydrated lemon powder can be used for skin whitening purposes that help to do away with marks, blemishes and spots by adding a degree of fairness to the complexion owing to the surplus of Vitamin C and Citric Acids that Lemon peels contain. Grated lemon peel is effective enough to treat pigmentations and suntan in an all-natural manner. Lemon peel mask works as the ideal cure for oily skin as it helps to do away with excess oil secretions and thus provides for the ideal remedy for the oily skin woes.